One day after school my husband, two kids and I went on a mission to find cacao shells to use in our tea. Cacao shells are the casings around the chocolate nib. Chocolate makers have no use for them, but they are better than chocolate itself for making chocolatey tea infusions. We walked to Seahorse Chocolate, a small chocolate factory tucked in the back of an old red building just outside downtown Bend. RC unlocked the door for us and filled the dim-lit dark wood room edge to edge with wide-eyed, lit up energy. I offered to buy his shells, but he was happy enough that he would no longer have to throw them away. Because we had the kids in tow, he took us behind the aged red theater rope that separated the production area and led us on a bean-to-bar chocolate tour. A pallet in the center of the room piled high with canvas sacks looked like a centerpiece. The sacks burst with cocoa beans, raw, whole, and straight from Honduras, Fiji, and the Dominican Republic. I scoop them from here into my coffee roaster, he explained, showing us an old fashioned coffee roaster with beautiful silver molding. I noticed the large silver scoop tucked into his beans is the same style I use at my tea factory. Then I winnow them. The winnow machine separates the nib from the shell. The nib is what we use to make delicious chocolate. The shell has no purpose. Why do you want these again? I explained to RC they make amazing chocolate infusions, better than steeping chocolate itself. He paused with a bit of disbelief, shrugged, and moved on to show us the grinders with tiny-pored black stone disks. This is what turns these nibs and sugar into butter-smooth delicious chocolate. Sevi rose to her tippy toes in her little pink crocs to examine the mechanics of the grinder. When Ted asked him questions about chocolate, the words in RC’s answers seemed to lift him from the ground. Ted squeezed my hand and the kids followed at RC's heels as he turned the corner to a small basin with a thermometer sticking out of it. Then we pour the chocolate into a tempering pot. The chocolate is poured into the tempering pot and held at exactly 94 degrees. He showed them the molds and the final chocolate form and concluded our bean-to bar tour at a pile of small, unlabeled bags. Honduras, he said, breaking off two pieces of chocolate with electric hands and placing them in the warm, open palms of each child; Dominican Republic, a piece for Owen and a piece for Sevi; Fiji, a piece for Owen and a piece for Sevi. We stood at a countertop made out of a sideways door as RC and I compared notes on being small makers: if we’ve made any money yet, sourcing, being entrepreneurs while raising families. I saw signs of my own factory all around me: wooden pallets and silver bowls, labels, and scribbled notes taped to a variety of experiments. I saw what people see when they come to my tea factory. The worth of our work is in the passion, the process, and the people. It is not in the uniforms we don’t have, the photos that are not on the walls. There is no neon sign in front of his building, no professionally branded tasting room or glass wall for viewing a team of hair-netted chocolatiers whisking chocolate from station to station. The worth is in bringing RC’s compost-bound shells to our tea factory, unlatching the bin and breathing the chocolate scented air. I bring water to a rolling boil in the glass kettle my grandma gave me, saturate the shells, and watch the water darken. I pour the glistening liquor into a hand-me-down teacup. With upturned palms for a saucer, my nose bowed into the steam, I find myself inside a still moment immersed in the qualities of cacao: velvet, aromatic, dry, rich. The tea steams and a thin layer of fat forms, like an almost-mirror, glimmering on the surface. Looking up, I see my tea factory with fresh eyes, and all the worth of a hand-made life feels encased in this small moment. 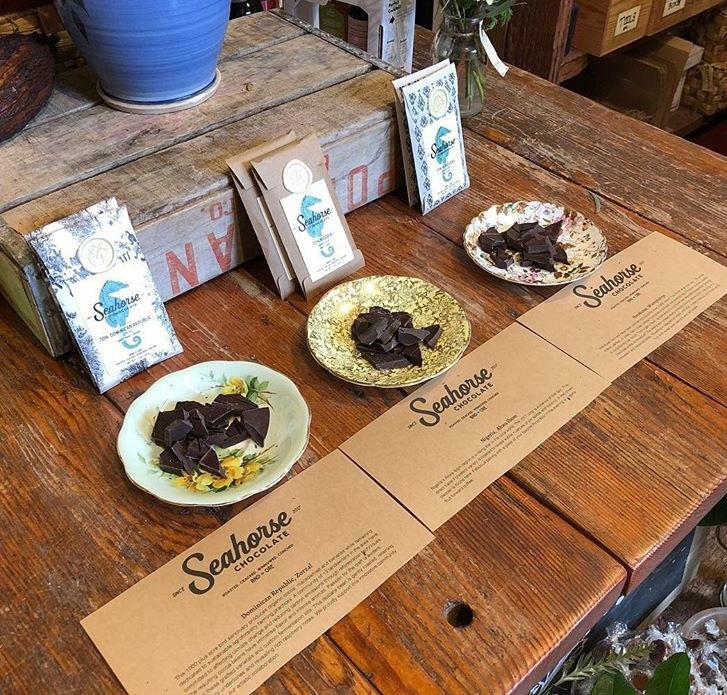 You can find RC’s chocolate company, Seahorse Chocolate, on his website and in shops around Bend, Oregon.